The Pz.Kpfw. IV Ausf. H is a German tier 5 medium tank. The G variant of the Pz. IV was produced starting in May 1942. In April 1943 production began on the H variant—eventually the most massively produced version of the Pz. IV. The Ausf. H shared the upgraded gun of the Ausf. G, and utilized a single 80-mm front glacis plate instead of layered plates. A new transmission slightly reduced vehicle speed but was more reliable. The tanks of this variant also featured side screens, 5–8 mm thick, on the hull and turret sides. A total of 3,774 vehicles of the Ausf. H were built. This tank is in essence a long range M4 Sherman, combining excellent accuracy with good gun depression, vision, and rate of fire. While not as fast as the the Pz.Kpfw. III/IV, the Pz.kpfw. IV is still about as mobile as the M4 (as well as having better hp/weight ratio), and has the option of 2 top guns: the accurate 7.5cm KwK 40 L/48 gun, or a superior 10.5cm KwK L/28 howitzer compared to the Sherman's. 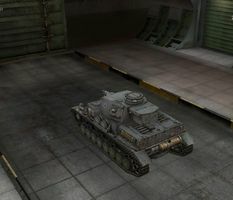 An interesting fact about this tank is that the pre patch 8.0 PZ IV (with the Schmalturm and L/70) was one of the very first tanks modeled in the game, along with the Tiger, T-34, and others. The Pz.Kpfw. IV Ausf. H leads to the VK 36.01 (H), and the VK 30.01 (P). You are not out of the woods yet (and in the opinion of some, you never will be with the German heavy line), because this tank is nowhere as über as World War II films or ACG works would have let you believed. It is however a consistent tank that can be played two ways, depending on whether you equip the medium-range 7.5cm L/48 or the 10.5cm L/28 Howitzer. Like all other tanks with the medium 75mm gun, it engages best at medium to long range in hills where possible, to make up for the below-average DPM. Comparing it to the Panzer 3/4 – with the higher RoF/DPM with the otherwise identical 7,5 cm gun, and the better short range punch with the 10,5cm gun, mean that the PzKpfw IV is better equipped for do-it-yourself firepower focused players. By contrast the PzKpfw III/IV in the Leopard 1 line is more suited for a more mobile spotting and assistance play style. The Pzkpfw. IV Ausf. H is difficult to play stock, since its weak engine and radio will all be hindrance to you. Support other more capable tanks is the best way to survive and earn good credits and experience. The second turret is an improvement from the stock turret in view range and rate of fire. Additionally, the turret gets some thin spaced armor which absorbs most HE hits. With the 7.5cm L/48, you're primarily a flanker or sniper, firing from a medium range and trying to remain out of the fray. In this role, equipping a Camo Net may be a good idea while you stay still and pump out the DPM, as the Pz IV had a very decent camo value for a medium tank. Unlike many German vehicles, the PzKpfw IV has decent gun depression, and can take up hull-down positions, even though your turret armour is inferior to your frontal hull armour value. Your turret presents a very small target, and is difficult to hit at range. 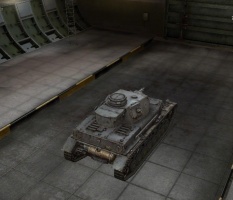 Beware that 7.5 cm L/48 can not penetrate more heavily armored tier 6 or tier 7 heavies from front without gold ammo. For above-mentioned reasons, the 10.5cm howitzer is the most used weapon on the PzKpfw IV and owes it popularity partially to its high alpha damage, which reduces exposure time when fighting close quarters when comparing time per damage dealt. With the 10.5cm, you get to play primarily as a brawler, getting close and slugging it out. However, the weak side and turret armor makes this an unfavorable choice if you're not cautious. 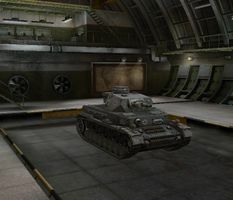 Keep in mind that you will often be facing tanks that can kill you in 2-4 shots, so even though the tank can work as a close quarters brawler, its light armor and hit points coupled with the slow gun reloading time must be taken into account when doing so. You should also note that the turret does not have that large a mantlet that could add to its 50 mm frontal armor, so most opponents will get a reliable penetration when they hit your turret front. Consequentially, hull down maneuvers are only useful when you can keep your opponents at long range so that they will miss your comparatively small turret often. Another well known vulnerability is the PzKpfw IV's extremely weak side armor, which is even vulnerable to 105mm or 122mm HE shots, since they can kill or nearly-kill the tank within one penetrating shot. It is worth noting that this tank is just slightly inferior to the M4 Sherman in terms of protection: its side armor and rear armor are inferior and its turret utterly outclassed. However, it has considerably more powerful stock and top gun than the M4 if comparing the 105mm howitzers. The weaker turret and more limited gun depression will hurt at times. Once in top configuration, the Pz IV's camo value, turret traverse speed and radio range are better and its acceleration should be slightly better due to having more higher horsepower/ton. Research L/48 if you don't have it already, then proceed to tracks, turret, and 10,5cm howitzer. The Panzerkampfwagen IV (Pz.Kpfw. IV), commonly known as the Panzer IV, was a medium tank developed in Nazi Germany in the late 1930s and used extensively during the Second World War. Designed as an infantry-support tank, the Panzer IV was not originally intended to engage enemy armor: that role was presumed for the lighter Panzer III. However, after shocking experiences when facing T-34 and KV tanks on the eastern front, the Panzer IV soon assumed the anti-tank role of its increasingly obsolete cousin. The most widely manufactured and deployed German tank of the Second World War, the Panzer IV was used as the base for many other fighting vehicles, including tank destroyers and self-propelled guns. Robust, reliable, and relativly simple to produce, it saw service in all combat theaters involving Germany, and has the distinction of being the only German tank to remain in continuous production throughout the war, with over 8,800 produced between 1936 and 1945. Upgrades and design modifications, often made in response to the appearance of new Allied designs, extended its service life. 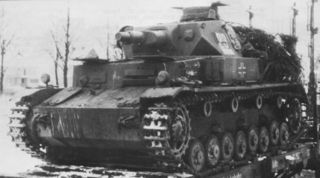 Generally, these involved increasing the Panzer IV's armor protection or upgrading its weapons, although during the last months of the war with Germanys pressing need for rapid replacement of losses, design changes also included retrograde measures to simplify and speed manufacture. In concept, it was intended to be a support tank for use against enemy anti-tank guns and fortifications. Ideally, the tank battalions of a panzer division were each to have three medium companies of Panzer IIIs and one heavy company of Panzer IVs. On 11 January 1934, the German army, highly influenced by Heinz Guderian, wrote the specifications for a "medium tractor", and issued them to a number of defense companies. To support the Panzer III, which would be armed with a 37-millimeter anti-tank gun, the new vehicle would have a short-barreled 75-millimeter howitzer as its main gun, and was allotted a weight limit of 24 tons. Development was carried out under the name Begleitwagen ("accompanying vehicle"), or BW, to disguise its actual purpose and hide from the Treaty of Versailles limitations. MAN, Krupp, and Rheinmetall-Borsig each developed prototypes, with Krupps selected for further development. The chassis had originally been designed with a six-wheeled interleaved suspension, but the German Army amended this to a torsion-bar system. Permitting greater vertical deflection of the roadwheels, this was intended to improve performance and crew comfort both on and off-road. However, due to the urgent requirement for the new tank, neither proposal was adopted, and Krupp instead equipped it with a leaf spring double-bogie suspension. The prototype required a crew of five men. The hull contained the engine bay to the rear, with the driver and radio operator, who doubled as the hull machine gunner, seated at the front-left and front-right, respectively. In the turret, the tank commander sat beneath his roof hatch, while the gunner was situated to the left of the gun breech, and the loader to the right. The turret was offset 66.5 mm to the left of the chassis center line, while the engine was moved 152.4 mm to the right. This allowed the torque shaft to clear the rotary base junction, which provided electrical power to turn the turret, while connecting to the transmission box mounted in the hull between the driver and radio operator. Due to the asymmetric layout, the right side of the tank contained the bulk of its stowage volume, which was taken up by ready-use ammunition lockers. Production began in 1936 at Krupp-Grusonwerke AG's factory at Magdeburg. The first mass-produced version of the Panzer IV was the Ausführung A in 1936. It was powered by Maybachs HL 108TR, producing 250 PS (183.87 kW), and used the SGR 75 transmission with five forward gears and one reverse. It achieved a maximum road speed of 31 kilometers per hour. As main armament, the vehicle mounted the Kampfwagenkanone 37 L/24 (KwK 37 L/24) 75 mm tank gun, which was a low-velocity gun designed to mainly fire high-explosive shells. Against armored targets, firing armor-piercing rounds at the velocity of 430 metres per second, the KwK 37 could penetrate 43 millimeters of armor, inclined at 30 degrees, at ranges of up to 700 meters. A 7.92 mm MG 34 machine gun was mounted coaxially with the main gun in the turret, while a second machine gun of the same type was mounted in the front plate of the hull. The Ausf. A was protected by 14.5 mm of steel armor on the front plate of the chassis, and 20 mm (0.79 in) on the turret. This was capable only of stopping artillery fragments, small-arms fire, and light anti-tank projectiles. Variants from Ausf. 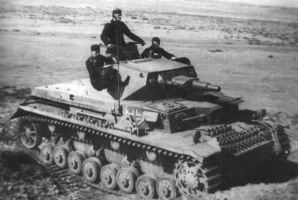 B to Ausf F1 featured mostly armor improvements, new engine, and suspenension, which when combined with wider tracks, increased the weight to 22.3 tons. Main armament was still the KwK 37 L/24, although tests with the 5 cm PaK 38 L/60 were succesful and the new gun was to be implemented in the next version. However, shocking experiences against Soviet T-34 and KV tanks caused this idea to be dropped, and a new 75 mm gun was to be implemented. Because the recoil length of the existing 7.5 cm PaK 40 L/46 gun was too long for the tanks turret, the recoil mechanism and chamber were shortened. This resulted in the 75-millimeter KwK 40 L/43. When firing an armor-piercing shot, the guns muzzle velocity was increased from 430 m/s to 990 m/s. Initially, the gun was mounted with a single-chamber, ball-shaped muzzle brake, which provided just under 50% of the recoil systems braking ability. Firing the Panzergranate 39, the KwK 40 L/43 could penetrate 77 mm of steel armor at a range of 1,830 m. The Ausf. F tanks that received the new, longer KwK 40 L/43 gun were named Ausf. F2. 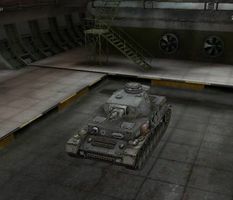 The tank increased in weight to 23.6 tons. One hundred and seventy-five Ausf. F2s were produced from March 1942 to July 1942. Three months after beginning production, the Panzer IV. Ausf. F2 was renamed the Ausf. G. There was little to no difference between the F2 and early G models. During its production run from May 1942 to June 1943, the Panzer IV Ausf. G went through further modifications, including another armor upgrade. Given that the tank was reaching its viable limit, to avoid a corresponding weight increase, the appliqué 20-millimeter steel plates were removed from its side armor, which instead had its base thickness increased to 30 millimeters. The weight saved was transferred to the front, which had a 30-millimeter face-hardened appliqué steel plate welded (later bolted) to the glacis: in total, frontal armor was now 80 mm thick. This decision to increase frontal armor was favorably received, according to troop reports on November 8, 1942, despite technical problems with the driving system due to added weight. 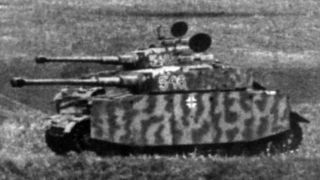 At this point, it was decided that 50% of Panzer IV productions would be fitted with 30 mm thick additional armor plates. Subsequently, on January 5, 1943, Hitler decided to make all Panzer IVs with 80 mm frontal armor. To simplify production, the vision ports on either side of the turret and on the right turret front were removed, while a rack for two spare road wheels was installed on the track guard on the left side of the hull. Complementing this, brackets for seven spare track links were added to the glacis plate. For operation in high temperatures, the engines ventilation was improved by creating slits over the engine deck to the rear of the chassis, and cold weather performance was boosted by adding a device to heat the engines coolant, as well as a starter fluid injector. A new light replaced the original headlight, and the signal port on the turret was removed. On March 19, 1943, the first Panzer IV with Schurzen skirts on its sides and turret was exhibited. 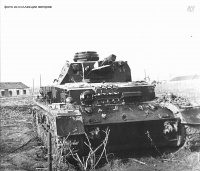 The double hatch for the commanders cupola was replaced by a single round hatch from the very-late model Ausf. G, and the cupola was up-armored as well. In April 1943, the KwK 40 L/43 was replaced by the longer 75-millimeter KwK 40 L/48 gun, with a redesigned multi-baffle muzzle brake with improved recoil efficiency. The next version, the Ausf. H, began production in April 1943. This variant saw the integrity of the glacis armor improved by manufacturing it as a single 80-millimeter plate. To prevent adhesion of magnetic anti-tank mines, which the Germans feared would be used in large numbers by the Allies, Zimmerit paste was added to all the vertical surfaces of the tanks armor. The vehicles side and turret were further protected by the addition of 5-millimeter side-skirts and 8-millimeter turret skirts. During the Ausf. H's production run, its rubber-tired return rollers were replaced with cast steel, and the hull was fitted with triangular supports for the easily-damaged side-skirts. There modifications meant that the tanks weight jumped to 25 tons, reducing its speed, a situation not improved by the decision to adopt the Panzer III's six-speed SSG 77 transmission, which was inferior to that of earlier-model Panzer IVs. , was considered a retrograde from the Ausf. H. Born of German necessity to replace heavy losses, it was greatly simplified to speed production. The electric generator that powered the tanks turret traverse was removed, and the turret had to be rotated manually. The space was later used for the installation of an auxiliary 200-litre (44 imp gal) fuel tank: road range was thereby increased to 320 kilometers (198.84 mi). The pistol and vision ports in the turret were removed, and the engines radiator housing was simplified by changing the slanted sides to straight sides. In addition, the cylindrical muffler was replaced by two flame-suppressing mufflers. By late 1944, Zimmerit was no longer being applied to German armored vehicles, and the Panzer IV's side-skirts had been replaced by wire mesh, and to further-speed production, the number of return rollers was reduced from four to three. 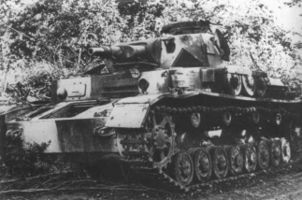 In a bid to augment the Panzer IV's firepower, an attempt was made to mate a Panther turret Schmallturm carrying the longer 75 mm L/70 tank gun to a Panzer IV hull. This was unsuccessful, and confirmed that the chassis had, by this time, reached the limit of its adaptability in both weight and available volume. The Panzer IV was the only German tank to remain in both production and combat throughout World War II, and measured over the entire war, it comprised 30% of the Wehrmachts total tank strength. Although in service by early 1939, in time for the occupation of Czechoslovakia, at the start of the war the majority of German armor was made up of obsolete Panzer Is and Panzer IIs. When Germany invaded Poland on 1 September 1939, the modern Panzer III and IV vehicles amounted to less than 10% of Germanys armored strength. Although the Polish army possessed less than 200 tanks capable of penetrating the German light tanks, Polish anti-tank guns proved more of a threat, reinforcing German faith in the value of the close-support Panzer IV. Despite increasing production of the medium Panzer IIIs and IVs prior to the German invasion of France on 10 May 1940, the majority of German tanks were still light types. According to Heinz Guderian, the Wehrmacht invaded France with 523 Panzer Is, 955 Panzer IIs, 349 Panzer IIIs, 278 Panzer IVs, 106 Panzer 35(t)s, and 228 Panzer 38(t)s. Through the use of tactical radios and superior tactics, the Germans were able to outmaneuver and defeat French and British armor. However, Panzer IVs armed with the KwK 37 L/24 75-millimeter tank gun found it difficult to engage French tanks such as the Somua S35 and Char B1, and the British Matilda Mk II was an even more formidable opponent. 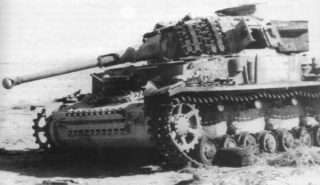 Although the Panzer IV was deployed to North Africa with the German Afrika Korps, until the longer gun variant began production, the tank was outperformed by the Panzer III with respect to armor penetration. Both the Panzer III and IV had difficulty in penetrating the British Matilda II's thick armor, while the Matildas 40-mm QF 2 pounder gun could knock out either German tank: its major disadvantage was its low speed. By August 1942, Rommel had only received 27 Panzer IV Ausf. 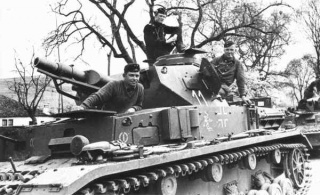 F2s armed with the L/43 gun, which he deployed to spearhead his armored offensives. The longer gun could penetrate all American and British tanks in the theater at ranges of up to 1,500 m. Although more of these tanks arrived in North Africa between August and October 1942, their numbers were insignificant compared to the amount of matériel shipped to British forces. The Panzer IV also took part in the invasion of Yugoslavia and the invasion of Greece in early 1941. PzKpfw IV Ausf H, somewhere on the eastern front. Note the armor skirts. With the launching of Operation Barbarossa on 22 June 1941, the unanticipated appearance of the KV-1 and T-34 tanks prompted an upgrade of the Panzer IV's 75 mm gun to a longer, high-velocity 75 mm gun suitable for antitank use. This meant that it could now penetrate the T-34 at ranges of up to 1,200 m at any angle. The 75 mm KwK 40 L/43 gun on the Panzer IV could penetrate a T-34 at a variety of impact angles beyond 1,000 m range and up to 1,600 m Shipment of the first model to mount the new gun, the Ausf. F2, began in the spring 1942, and by the summer offensive there were around 135 Panzer IVs with the L/43 tank gun available. At the time, these were the only German tanks that could defeat the Soviet T-34 or KV-1. 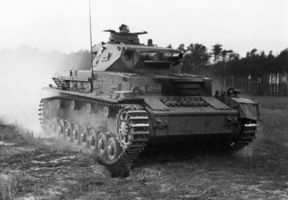 They played a crucial role in the events that unfolded between June 1942 and March 1943, and the Panzer IV became the mainstay of the German panzer divisions. Although in service by late September 1942, the Tiger I was not yet available in high enough numbers to make an impact and suffered from serious teething problems, while the Panther was not delivered to German units in the Soviet Union until May 1943. 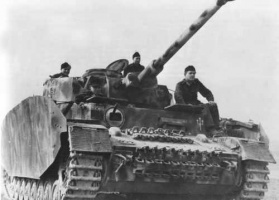 The extent of German reliance on the Panzer IV during this period is reflected by their losses: 502 were destroyed on the Eastern Front in 1942. The Panzer IV continued to play an important role during operations in 1943, including at the Battle of Kursk. 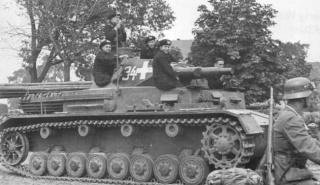 Newer types such as the Panther were still experiencing crippling reliability problems that restricted their combat efficiency, so much of the effort fell to the 841 Panzer IVs that took part in the battle. Throughout 1943, the German army lost 2,352 Panzer IVs on the Eastern Front: some divisions were reduced to 12–18 tanks by the end of the year. 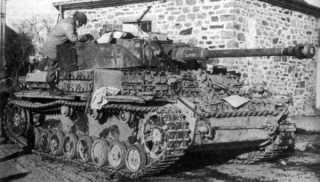 In 1944, a further 2,643 Panzer IVs were destroyed, and such losses were becoming increasingly difficult to replace. By the last year of the war, the Panzer IV was outclassed by the upgraded T-34-85, which had an 85 mm gun, and other late-model Soviet tanks such as the 122 mm armed IS-2 heavy tank. Nevertheless, due to a shortage of replacement Panther tanks, the Panzer IV continued to form the core of Germanys armored divisions, including elite units such as the II SS Panzer Corps, through 1944. In January 1945, 287 Panzer IVs were lost on the Eastern Front. It is estimated that combat against Soviet forces accounted for 6,153 Panzer IVs, or about 75% of all Panzer IV losses during the war. Panzer IVs comprised around half of the available German tank strength on the Western Front prior to the Allied invasion of Normandy on June 6, 1944. Most of the 11 panzer divisions that saw action in Normandy initially contained an armored regiment of one battalion of Panzer IVs and another of Panthers, for a total of around 160 tanks, although Waffen-SS panzer divisions were generally larger and better-equipped than their Heer counterparts. Regular upgrades to the Panzer IV had helped maintain its reputation as a formidable opponent. Despite overwhelming Allied air superiority, the Norman bocage countryside in the US sector heavily favored defense, and German tanks and anti-tank guns inflicted horrendous casualties on Allied armor during the Normandy campaign. 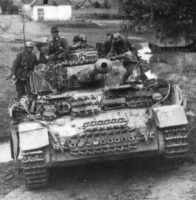 On the offensive, however, the Panzer IVs, Panthers, and other armored vehicles proved equally vulnerable in the bocage, and counter-attacks rapidly stalled in the face of infantry-held anti-tank weapons, tank destroyers, and anti-tank guns, as well as the ubiquitous fighter bomber aircraft. That the terrain was highly unsuitable for tanks was illustrated by the constant damage suffered to the side-skirts of the Ausf. Hs: essential for defence against shaped-charge anti-tank weapons such as the British PIAT. All German armored units were "exasperated" by the way these were torn off during movement through the dense orchards and hedgerows. The Allies had also been developing lethality improvement programs of their own; the widely-used American-designed M4 Sherman medium tank, while mechanically reliable, suffered from thin armor and an inadequate gun. Against earlier-model Panzer IV's it could hold its own, but with its 75mm M3 gun struggled against the late-model Panzer IV (and was unable to penetrate the frontal armor of Panther and Tiger tanks at virtually any range). The late-model Panzer IV's 80mm frontal hull armor could easily withstand hits from the 75mm weapon on the Sherman at normal combat ranges, though the turret remained vulnerable. The British up-gunned the Sherman with their highly effective QF 17-pounder anti-tank gun, resulting in the Firefly. Although this was the only Allied tank capable of dealing with all current German tanks at normal combat ranges, few (about 300) were available in time for the Normandy invasion. However, despite the general superiority of its armored vehicles, by August 29, 1944, as the last surviving German troops of Fifth Panzer Army and Seventh Army retreated toward Paris, the twin cataclysms of the Falaise Pocket and the Seine-crossing had cost the Wehrmacht dearly. Of the 2,300 tanks and assault guns it had committed to Normandy (including around 750 Panzer IV's) over 2,200 had been lost. Field Marshal Walter Model reported to Hitler that his panzer divisions had remaining, on average, five or six tanks each. 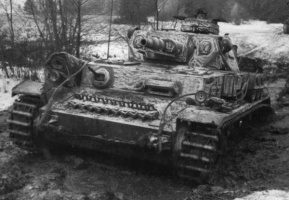 During the winter of 1944–45 the Panzer IV was one of the most widely used tanks in the Ardennes offensive, where further heavy losses, as often due to fuel shortages as to enemy action, impaired major German armored operations in the West thereafter. The Panzer IV's that took part were survivors of the battles in France between June and September 1944, with around 260 additional Panzer IV Ausf. J's issued as reinforcements. No historical records of the 10,5 cm Kw.K. L/28 configuration exists. This page was last modified on 29 November 2018, at 14:34. This page has been accessed 64,177 times.